ShenZhen Pchood Technology Co., Ltd. founded in 2007, located in Shenzhen's most prosperous area—— North HuaQiang region, the main products include professional DSLR Film Equipment, computer monitors hood and the high-level customed lens. CINEMATICS means "MOVIE art", in 2010, P&E Beijing exhibition officially launched CINEMATICS 5D DSLR Film Equipment, with the Full HD EOS MOVIE powerful video shooting function, to help 5D Mark II users complete the professional production of the low cost of movies. CINEMATICS 5D DSLR Film Equipment provides a complete solution, including: the camera follow focus, shading filter system, the battery pinch, shoulder support system system, handles and C-shape support, the HDMI monitor, high-capacity power support system, HDMI high definition signals transmission conversion programs and equipment, etc. Due to the use of modular design, components of different functional modules can be based on actual needs with free, light weight structural materials used mainly in aerospace and high strength aluminum alloy. 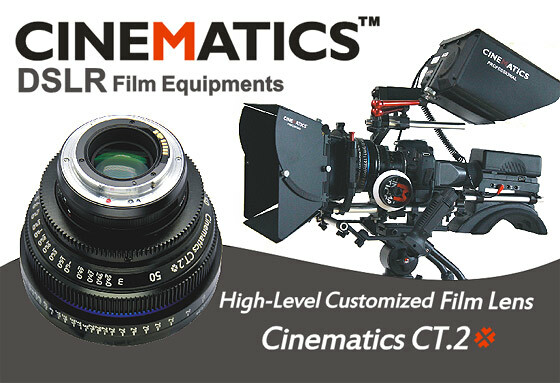 CINEMATICS 5D DSLR Film Equipment is an open and free systems, will also continuous improvement and innovation, also can follow the specific requirements of custom. Lower cost and more precise capabilities help the dream of making a movie come true!